Panasonic is back! 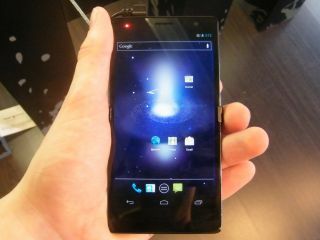 (in the mobile market, in Europe) The Panasonic Eluga Power has been unveiled at MWC 2012 and is the big screened, yet slender new kid on the 5-inch display block. Panasonic's unique narrow frame technology has enabled it to squeeze the Eluga Power to just 9.6mm in depth while packing a 1.5GHz dual-core processor, 1GB of RAM, 8GB of internal storage, NFC technology, 8MP camera with full HD (1080p) video recording and a 5-inch HD (1280 x 720) LCD screen. Oh and it's also dust and waterproof. Expect to see the Panasonic Eluga Power in the UK towards the end of Q2/early Q3 as it goes head to head with the likes of the Samsung Galaxy Note and the LG Optimus Vu.